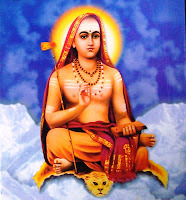 Today is Sri Sankara Jayanthi. A brief life is posted here. to the nambudiri brahmana couple, Sivaguru and Aryamba, in a little village called Kaladi in Kerala. The couple had remained childless for a long time, and prayed for children at the Vadakkunnathan (vrshacala) temple in nearby Trichur. Lord Siva is said to have appeared to the couple in a dream and promised them a choice of one son who would be short-lived but the most brilliant philosopher of his day, or many sons who would be mediocre at best. The couple opted for a brilliant, but short-lived son, and so Sankara was born. Sankara lost his father when quite young, and his mother performed his upanayana ceremonies with the help of her relatives. Sankara excelled in all branches of traditional vaidika learning. A few miracles are reported about the young Sankara. As a brahmacarin, he went about collecting alms from families in the village. A lady who was herself extremely poor, but did not want to send away the boy empty-handed, gave him the last piece of Amla fruit she had at home. Sankara, sensing the abject poverty of the lady, composed a hymn (kanakadhara stavam) to Sri Lakshmi, the goddess of wealth, right at her doorstep. As a result, a shower of golden Amlas rewarded the lady for her piety. On another occasion, Sankara is said to have re-routed the course of the Purna river, so that his old mother would not have to walk a long distance to the river for her daily ablutions. Sankara was filled with the spirit of renunciation early in his life. Getting married and settling to the life of a householder was never part of his goal in life, though his mother was anxious to see him as a grhastha. Once when he was swimming in the river, a crocodile caught hold of his leg. Sankara sensed that he was destined to die at that moment, and decided to directly enter the fourth Asrama of sannyasa right then. This kind of renunciation is called Apat sannyasa. The crocodile released him when he thus mentally decided to renounce the world, and Sankara decided to regularize his decision by going to an accomplished guru. To comfort his anxious mother, he promised that he would return at the moment of her death, to conduct her funeral rites, notwithstanding the fact that he would be a sannyasi then. Sri Sankara then traveled far and wide in search of a worthy guru who would initiate him and regularize his vow of sannyasa, till he came to the banks of the river Narmada in central India. Here was the Ashrama of Govinda Bhagavatpada, the disciple of Gaudapada, the famous author of the Mandukya Karikas. Sri Sankara was accepted as a disciple by Govinda, who initiated him into the paramahamsa order of sannyasa, the highest kind of renunciation. Seeing the intellectual acumen of his disciple, Govinda commanded Sri Sankara to expound the philosophy of Vedanta through commentaries on the principal Upanishads, the Brahmasutras and the Gita. Sri Sankara took leave of his guru and traveled to various holy places in India, composing his commentaries in the meantime. At this time he was barely a teenager. He attracted many disciples around him, prominent among whom was Sanandana, who was later to be called Padmapada. In this period, Sri Sankara wrote commentaries on badarayana's brahmasutras, the various upanishads and the Bhagavad Gita. These commentaries, called bhashyas, stand at the pinnacle of Indian philosophical writing, and have triggered a long tradition of sub-commentaries known as Varttikas, TIkas and Tippanis. He also commented upon the adhyatma-patala of the Apastamba sutras, and on Vyasa's bhashya to Patanjali's Yogasutras. In addition to these commentarial texts, Sri Sankara wrote independent treatises called prakarana granthas, including the Upadesasahasri, Atmabodha, etc. In addition to writing his own commentaries, Sri Sankara sought out leaders of other schools, in order to engage them in debate. As per the accepted philosophical tradition in India, such debates helped to establish a new philosopher, and also to win disciples and convert from other schools. It was also traditional for the loser in the debate to become a disciple of the winner. Thus Sri Sankara debated with Buddhist philosophers, with followers of Samkhya and with Purva Mimamsakas, the followers of Vedic ritualism, and proved more than capable in defeating all his opponents in debate.Sri Sankara then sought out Kumarila Bhatta, the foremost proponent of the Purva Mimamsa in his age, but Bhatta was on his deathbed and directed Sri Sankara to Visvarupa, his disciple. Visvarupa is sometimes identified with Mandana Misra. Sri Sankara's debate with Visvarupa was unique. The referee at the debate was Visvarupa's wife, Bharati, who was herself very well-learned, and regarded as an incarnation of Goddess Sarasvati. At stake was a whole way of life. The agreement was that if Visvarupa won, Sri Sankara would consent to marriage and the life of a householder, whereas if Sri Sankara won, Visvarupa would renounce all his wealth and possessions and become a sannyasi disciple of Sri Sankara. The debate is said to have lasted for whole weeks, till in the end, Visvarupa had to concede defeat and become a sannyasi. Bharati was a fair judge, but before declaring Sri Sankara as the winner, she challenged Sri Sankara with questions about Kamasastra, which he knew nothing about. Sri Sankara therefore requested some time, during which, using the subtle yogic process called parakaya-pravesa, he entered the body of a dying king and experienced the art of love with the queens. Returning to Visvarupa’s home, he answered all of Bharati's questions, after which Visvarupa was ordained as a sannyasi by the name of Suresvara. He was to become the most celebrated disciple of Sri Sankara, writing Varttikas to Sri Sankara's Bhashyas on the Yajurveda Upanishads, in addition to his own independent texts on various subjects. Sri Sankara continued to travel with his disciples all over the land, all the while composing philosophical treatises and engaging opponents in debate. It is said that none of his opponents could ever match his intellectual prowess and the debates always ended with Sri Sankara's victory. No doubt this is true, given the unrivaled respect and popularity that Sri Sankara's philosophical system enjoys to this day. In the course of his travels, Sri Sankara stayed for a long time at the site of the old Ashama of the Rishis Vibhandaka and Rshyasrnga, in the place known as Sringeri. Some texts mention that Sri Sankara stayed at Sringeri for twelve years. A hermitage grew around him here, which soon developed into a famous Math (monastery). Suresvara, the disciple whom he had won after long debate, was installed as the head of this new Ashrama. Similar Maths were established in the pilgrim centers of Puri, Dvaraka and Joshimath near Badrinath, and Padmapada, Hastamalaka and Trotaka were placed in charge of them. These are known as the Amnaya Maths, and they continue to function today. Their heads have also come to be known as Sankaracaryas, in honor of their founder, and revered as jagadgurus, or teachers of the world. Sri Sankara also organized the community of Ekadandi monks into the sampradaya of Dasanami sannyasins, and affiliated them with the four Maths that he established. Meanwhile, Sri Sankara heard that his mother was dying, and decided to visit her. Remembering his promise to her, he performed her funeral rites. His ritualistic relatives would not permit him to do the rites himself, as he was a sannyasi, but Sri Sankara overrode their objections, and built a pyre himself and cremated his mother in her own backyard. After this, he resumed his travels, visiting many holy places, reviving pujas at temples that had fallen into neglect, establishing Sri Yantras at Devi temples as in Kanchipuram, and composing many devotional hymns. Sri Sankara was reaching the age of 32 now. He had expounded the Vedanta philosophy through his writings; he had attracted many intelligent disciples to him, who could carry on the Vedantic tradition; and he had established monastic centers for them in the form of Maths. His had been a short, but eventful life. He retired to the Himalayas and disappeared inside a cave near Kedarnath. This cave is traditionally pointed out as the site of his samadhi. Other variant traditions place Sri Sankara's last days at Karavirpitham or at Mahur in Maharashtra, Trichur in Kerala or Kanchipuram in Tamil Nadu. It is a measure of Sri Sankaracarya's widespread fame that such conflicting traditions have arisen around his name. True to the traditions of sannyasa, Sri Sankara was a peripatetic monk, who traveled the length and breadth of the country in his short lifetime. His fame spread so far and wide, that various legends are recounted about him from different parts of India. The true sannyasi that he was, he lived completely untouched by the fabric of society. So much so that even the location of Kaladi, his birth-place, remained generally unknown for a long time. The credit of identifying this village in Kerala goes to one of his 19th-century successors at Sringeri, Sri Saccidananda Sivabhinava Narsimha Bharati. Reference: SrimatSwami Tapasyananda, The Sankara-dig-vijaya of Madhava-Vidyaranya, Ramakrishna Math, Chennai-4.